Mauerpark is an unique meeting place for people of different cultural, generational and social backgrounds. Music constitutes a fundamental part of legendary Sundays at Mauerpark. 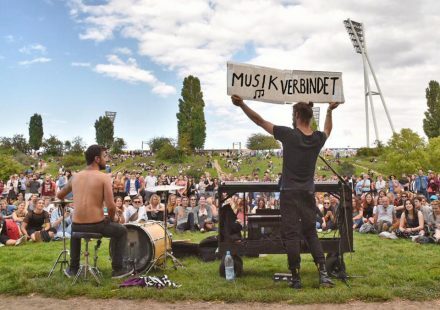 At the moment, at the initiative of single residents, many musicians are being consistently reported to the authorities and kicked out of the Mauerpark. Forbidding music, certain music genres, music instruments and generally electric amplification destroys the cultural diversity and the very character of the Mauerpark. Join us for cultural diversity of Mauerpark! of its creative richness and music. Dieser Eintrag wurde am Saturday, den 15. September 2018 um 09:30 Uhr von Mauerpark Redaktion erstellt und ist in der Kategorie Events, General, Politics zu finden. Kommentare und Pings sind derzeit nicht erlaubt.